give love to your community WHEN YOU PICTURE A PHILANTHROPIST, WHAT DO YOU SEE? We hope you see yourself because philanthropy is more than giving money. It’s sharing valuable resources such as your time and talent to our community. The Kalamazoo Community Foundation, in partnership with Gryphon Place Volunteer Services, is celebrating Volunteer Month by hosting the 5th Annual Find Your Cause event from 5 to 7pm on April 11 at the Girl Scouts Heart of Michigan to connect our community with local nonprofits on ways to get involved with their work. CAN’T MAKE IT TO THE EVENT? We encourage you to explore ways in the month of April to connect with our community through your gift of time and talent. We would be happy to connect you to nonprofits in our community! PRICE! Save Thousands Over New! On Choice Courtesy Transportation Demo Vehicles - Limited Selection. THE PEOPLE YOU TRUST We listen and we deliver. Let us put our 38 years of remodeling expertise to work for you. Confidence and trust...are just a couple of the things we build well. As an Independent Agency, Ralph Hayward/Trust Shield Insurance Group strives to offer the most comprehensive coverages with a competitive price. We are not here just to sell you insurance but to be a partner in protection for all of your personal & business insurance needs. www.encorekalamazoo.com 117 W. Cedar St. Suite A, Kalamazoo, MI 49007 Telephone: (269) 383-4433 Fax: (269) 383-9767 Email: Publisher@encorekalamazoo.com The staff at Encore welcomes written comment from readers, and articles and poems for submission with no obligation to print or return them. To learn more about us or to comment, visit encorekalamazoo.com. 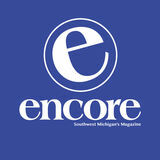 Encore subscription rates: one year $36, two years $70. Current single issue and newsstand $4, $10 by mail. Back issues $6, $12 by mail. Advertising rates on request. Closing date for space is 28 days prior to publication date. Final date for print-ready copy is 21 days prior to publication date. The opinions, beliefs and viewpoints expressed by those interviewed and published here do not reflect the opinions, beliefs and viewpoints of Encore Magazine or the official policies, owners or employees of Encore Publications. first pedestrian mall and its first curb cuts for those with disabilities. We were the first city in the country with a school district that gives free college tuition to its graduates. 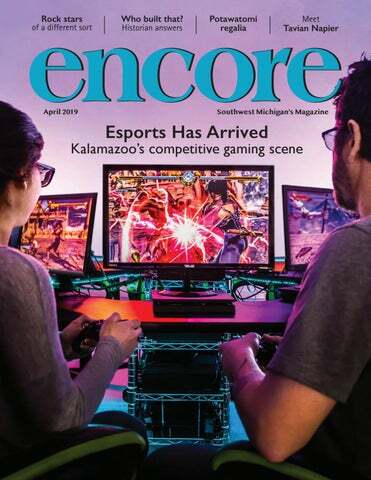 And now, thanks to the foresight of Western Michigan University, we are once again on the leading edge — this time in esports. With the opening of its esports arena in October, WMU now houses a leading university esports facility in the Midwest and one of only a handful in the country. The university’s arena and accompanying esports program and club teams are a reflection of a new reality: Video gaming is more than just a kids’ hobby. The popularity of esports, or competitive gaming, is exploding. Beginning with the generation that played Pong and Pac-Man against a friend to today’s gamers who duel in fighting games with multiple competitors across the globe, playing video games has become as ubiquitous as text messaging. It is a nondiscriminatory sport. All ages, genders, races and economic classes play video games of some form or another. Set aside the argument about esports being a “real sport” for a minute — according to Mark Koski, CEO of the National Federation of State High School Associations, the governing body for high school sports and activities, there are more students participating in gaming than there are in most other sports. That’s why this month Encore is exploring the local esports scene. Writer Ben Lando sheds light on where esports is happening locally and who is involved in it. He also explains what esports is (for those of us still trying to figure it out) and why it has become the fastest-growing spectator sport in the world. We also introduce you to Tavian Napier, WMU’s esports coordinator, who works in a career that simply didn’t exist a few years ago. I’m the first to admit that until we did this story, I really didn’t understand esports (and I have a 16-year-old video game enthusiast in my home). But Ben’s reporting has instilled in me an appreciation for the universality of esports and its role as a great equalizer. Size, shape and strength don’t matter in esports. You can be a 20-year-old gay African-American who likes to dress up in animal costumes when you play and be named esports’ Player of the Year. You've got to love that. A law firm focusing on estate planning, estate settlement, and the transfer of wealth. ROI is the first step. ROW is the journey. ROI plays an important role in one’s financial position, which is why Greenleaf Trust’s sophisticated investment platforms (with over $12 billion in assets under advisement) are so robust. But without a holistic return on wealth (ROW) management strategy that integrates performance with tax planning, trusts, risk management, cash flow, retirement, estate planning, and charitable giving, ROI only goes so far. That’s why now is the perfect time to maximize your own return on wealth. Because otherwise, you’re moving sideways. Call us. Good things are ahead. Client relationships begin at $2 million. Meet Tavian Napier — What exactly does an esports coordinator do? On the cover: Two gamers compete head to head at Glitch Gaming Lounge in Portage. Photo by Brian K. Powers. Delving behind the scenes of the Kalamazoo Geological and Mineral Society’s 60th anniversary Rock, Gem, Fossil and Mineral Show evoked fond memories for Julie of digging up brachiopods and pyrite in northern Ohio. She admits to being fond of rocks and “marvels at the beauty of minerals and gems.” Julie lives in Galesburg with her husband and son, is a budget analyst at Western Michigan University, has more hobbies than time, and is always writing. Before he began to research this month’s story on the local esports scene, all Ben knew about video gaming was from memories of playing on an old Nintendo system and PlayStation as a kid and playing random arcade games at bars. After starting his research, he took his 6-year-old son with him to try out Glitch Gaming Lounge, where the two of them played Fortnite. Neither fared very well in their maiden visit, but they both may be hooked on gaming. "We should probably stick to playing Mario Kart,” he admits. A journalist for 18 years, Ben is a fourth-generation Kalamazooan who spent seven years reporting from Washington, D.C., and Baghdad before returning home in 2013. Adam isn't new to gaming, but esports has been an entirely different experience for him. He says he learned a lot about what goes into the competitive sport while talking to Tavian Napier, WMU’s esports coordinator, for our Back Story feature this month. Adam is a native of Monroe and will graduate from WMU in April with a bachelor's degree in journalism. Looking for a new view? Bell’s to host Pure Michigan band and singer Mason Jennings Two indie/folk shows are coming to Bell’s Eccentric Café in short succession this month: The young Traverse City natives The Accidentals play on April 25 and singersongwriter Mason Jennings on April 27. The members of The Accidentals grew up in musical families and use their orchestral backgrounds to create interesting and unexpected but entirely “jammable” tunes. Their original song “Michigan and Again” was featured in a Pure Michigan commercial. Jennings — born in Hawaii, but basically from all over the U.S. — has been writing and recording music since 1997. His most recent album, Songs from When We Met (2018), was born of his battle with agoraphobia and focuses on the feelings of love and creativity he found along the way. Tickets for each show are $20 in advance or $25 the day of the show. Doors open at 7:30 p.m., and the shows start at 8:30. You must be legally able to partake in Bell’s libations to attend. For tickets or more information, visit bellsbeer.com/events/cafe or call 382-2332. Game Changers at Air Zoo It’s all fun and games at the Air Zoo until mid-May now that the traveling exhibit Game Changers has landed. Exploring more than 140 iconic video games that have had significant impact on game design in popular culture, this interactive exhibit narrates how every evolution — from graphics and soundtracks to storylines and technological advancements — has shaped video gaming and transformed the way we interact with technology. Admission to the exhibit is included in general admission, which is $15.95 for adults and $14.95 for children 5 and older. Children 4 and younger and Air Zoo members get in free. There are also discounts for seniors, veterans, military members, and police and firefighters. The Air Zoo, located at 6151 Portage Road, is open 9 a.m. to 5 p.m. Monday through Saturday and noon to 5 p.m. Sunday. For more information, visit airzoo.org or call 350-2848.
it comes to piano, Murray Perahia is right at the top. Lucky for Kalamazoo, he will be here May 5 to perform at Chenery Auditorium. The Grammy Award-winning Perahia, who has recorded 12 albums of music from Bach and Beethoven to Schubert and Chopin, is known as a keyboard virtuoso “with consummate technical skills, boundless imagination and near-mystical eloquence,” according to Deutsche Grammophon, a German classical music record label. The concert, sponsored by The Gilmore, begins at 4 p.m., but Perahia will present a pre-concert talk at 3 p.m. Tickets are $35-$55, or $7 for students with a valid ID. For more information or to purchase tickets, visit thegilmore.org. year, and what better way to celebrate it than at Green-a-Thon? This annual free event, set for 11 a.m.–3 p.m. April 13 at Celery Flats Historical Area, 7335 Garden Lane, is a pre-Earth Day celebration of being green, hosted by Portage’s Youth Advisory Committee, in cooperation with its Environmental Board and Park Board. There will be games, seedling giveaways and local organizations and businesses providing education about environmental issues. For more information, visit portagemi.gov/441/ events. OK Go brings live video show to State Get your treadmills ready. Those viral video sensations known as OK Go are coming to the State Theatre April 28. The indie rockers got their big break, in part, with their viral DIY music video for “Here it Goes Again,” in which they dance on treadmills. Since then, OK Go’s music videos have included Victorian wallpaper, zero-gravity airplane stunts and other cool concepts. Also, did you know that one of the band members, Tim Nordwind, graduated from Loy Norrix in 1994? Doors open at 6 p.m., and this all-ages show starts at 7. Tickets range from $39.50¬–$49.50. For tickets or more information, visit kazoostate.com or call 345-6500.
the Jolliffe Theatre, 359 S. Kalamazoo Mall. The film, created by Kelly Wittenberg, an assistant professor in the School of Communication at Western Michigan University, will be featured during the Kalamazoo Film Society’s Art Hop event, set for 5-8 p.m. The event will show selected award-winning films from the Thomas Edison Black Maria Film Festival. This annual international festival, run by a New Jersey consortium, selects short works by independent filmmakers that are shown across the U.S. Representative tells the story of Wittenberg’s relationship with her father, a state representative from Nevada, while weaving in intra-family dynamics, politics and Cold War tensions. It won the 2019 Jury’s Choice Award in the Thomas Edison Black Maria Film Festival. It was also an official selection for the Nevada Women’s Film Festival, held in March in Las Vegas. For more information, visit kalfilmsociety.net. Rockwell LeRoy After spending his teenage years as a cowboy in Nebraska, LeRoy moved to Coldwater to work as a contractor, coming to Kalamazoo in the 1890s to supervise construction at the Michigan Buggy Co. For more than 40 years, he designed buildings in Kalamazoo, including several schools and vaudeville/ movie theaters, such as the Elite Theatre, pictured above, formerly at 315 S. Burdick St. He was the architect for the bandshell, auditorium and entrance for Oakwood Park, on Woods Lake. Some of the buildings he designed that remain are Lincoln Elementary School, on North Burdick Street; the Haymarket Building, on East Michigan Avenue; the Federal Building and U.S. Courthouse, on West Michigan Avenue; and Chenery Auditorium, part of the former Kalamazoo Central High School, on South Westnedge Avenue. Lemuel D. Grosvenor Not much is known about Grosvenor, who designed several houses and a prominent industrial building in the city. He was born in Massachusetts but was working as an architect in Jackson, Michigan, by the 1860s. Of the five houses he designed in Kalamazoo, two remain: the Johnson House, at 211 W. Woodward Ave., in the Stuart Historic District, and the Hall House, originally located on the site of the Park Club, on South Street across from Bronson Park, but now at 725 Academy St., having been moved there in the late 1880s. In addition to these Italianate and Second Empire homes, Grosvenor designed the Lawrence and Chapin Iron Works, pictured above, on the northwest corner of North Rose and West Water streets, also in the Second Empire style. Ernest Batterson Batterson, who was born in Battle Creek, worked with his father, a carpenter, and later received his architectural training through a correspondence course. He worked with Kalamazoo architect Rockwell LeRoy, and in 1919 opened his own practice covering southwestern Michigan. The list of his buildings in Kalamazoo includes houses along Oakland Drive, pictured above, and in the Hillcrest, Orchard Hills and West Main Hill neighborhoods. He designed several elementary schools in the area, including South Westnedge Elementary, now Paramount Charter Academy, in addition to the former Salvation Army building on the corner of North Rose and Eleanor streets. His largest building is the First United Methodist Church on South Park Street, completed in 1928 with Gothic Revival features like the prominent arched window that also can be found on other some of his other structures. their long list of structures includes many still with us today. Bush first came here at age 12, working as a clerk and apprentice carpenter. He left four years later but returned in 1855, having met Paterson in New York. Bush convinced Paterson to come here, and they formed a partnership in 1855 that lasted for close to 40 years, employing up to 100 workers. Known for their quality workmanship, they built a variety of buildings, at least eight of which are still standing, including the Ladiesâ&#x20AC;&#x2122; Library Association building, at 333 S. Park St., pictured at left; the Michigan Central Railroad Station, on Kalamazoo Avenue; and the Wood-Upjohn House, at 530 W. South St.
Their firm may have been one of the busiest in the 1920s, designing schools, houses, factories, libraries and other buildings in the Kalamazoo area. Billingham attended Western State Normal School and worked for engineer Daniel Albertson and later architect Frank Shoemaker, who also employed Cobb. Billingham and Cobb’s eventual partnership, beginning in 1919, led to the design of nine local elementary schools, six of which are still in use, including Woodward Elementary and Parkwood-Upjohn Elementary, pictured above, as well as the Marlborough Apartments, Kalamazoo Public Library’s Washington Square Branch and the A.M. Todd Co. headquarters on Douglas Avenue. Even though the two men split in terms of their business partnership early in the 1930s, many of their collaborations continue to be a part of this community. About the Author Lynn Houghton is the regional history curator at the Western Michigan University Archives and Regional History Collections. She leads the Gazelle Sports Historic Walks, a series of free architectural and historic walks held at various locations in Kalamazoo County during the summer and fall, and is the coauthor of Kalamazoo Lost and Found. She also participated in the PBS series 10 that Shaped America. She has a bachelor’s and a master’s degree in history from WMU and a master’s in library and information science from Wayne State University. Photos courtesy of WMU Archives and Regional History Collections, the Kalamazoo Valley Museum and the Kalamazoo Public Library’s Local History Collection. Your local go-to sandwich shop featuring high quality meats, veggies and cheeses. booths at the Kalamazoo Geological and Mineral Society’s annual Rock, Gem, Fossil and Mineral Show at the Kalamazoo County Expo Center next month will undoubtedly see some unusual fossils and stones, but they are likely to overhear some interesting things as well. “Let’s pan for gold after we buy beads” or “I‘d like a chunk of rose quartz for a doorstop” or “Is that noise coming from a Tibetan singing bowl?” That’s because the Kalamazoo Geological and Mineral Society’s annual show attracts everyone from collectors and crafters to the just curious of all ages who all find something relatable about the allure of rocks, say organizers. “We continue to grow every year,” says Wrifton Graham, who chairs the annual show that attracted more than 6,000 attendees from Michigan, Illinois, Indiana and Ohio in 2018. “People will come from farther away if there are more vendors, and this year the show will be held in both the Expo South and the main Expo halls, totaling 44,000 square feet. This is a 65 percent increase in show space over last year, and we have the vendors and activities to fill it.” The show, set for May 3–5, marks the organization’s 60th anniversary, and Graham expects attendance to grow to more than 8,000 attendees this year, especially with a draw such as Steve Arnold, a worldrenowned meteorite hunter and co-star of the adventure reality TV show Meteorite Men, who will discuss his fascinating adventures. Right: Pieces of tall teal tourmaline on display with moldavite (dark green) and other minerals at the show. Far right: A chunk of pyrite/galena, at right, next to a piece of azurite and malachite. Geodes range in price from $3 to $60 at the show and are manually cracked open using a toothy, cast-iron pipe cutter. If one’s a dud (known as a mud ball), it’s replaced. “Geodes are formed in gas bubbles in volcanic ash, and then all the minerals come through the ash and deposit into the bubbles,” says Payne. “That’s why they are round — they’re formed in gas bubbles and found 100 to 200 feet under the ground.” Geodes sold at the show are sourced from a mine in Mexico and purchased through a Texas dealer. While hunters typically head to Western states to look for geodes, they can also find them along southern Lake Michigan and in Illinois, Indiana and Ohio. Students invited Above: Among the wares this vendor sells are slabs of fossil fish and orthoceras (squid fossils). Right: Students learn about minerals during the show's Kids' Day. Rock Out at the Rock Show What: The Kalamazoo Geological and Mineral Society’s 60th Anniversary Rock, Gem, Fossil and Mineral Show When: 4–8 p.m. May 3; 10 a.m.–6 p.m. May 4; and 10 a.m.–5 p.m. May 5 Where: Kalamazoo County Expo Center, 2900 Lake St. How much: Tickets are $4, or free for children 11 and younger who attend with a paying adult and for Boy Scouts, Girl Scouts, Campfire Girls and Bluebirds in uniform. More info: kalamazoorockclub.org scholarships for Western Michigan University geology students, and those scholarship recipients in turn make presentations at fall KGMS meetings each year to explain how the funding was used to further their educations. “There’s no typical person who joins the KGMS,” says KGMS President David Haas. Currently the organization has more than 200 members ages 6 to 89, and annual memberships are $8 for students, $10 for seniors and $15 for families. “What they all have in common: They like rocks. Everybody likes a different kind of rock and does different things with it,” says Haas. “Some like fine minerals, some join just to get rocks for their yard, some want to learn how to wire wrap — I have a trailer to teach how to make cabochons — and some are into the metaphysical.” Haas says the organization tries to accommodate varying interests when it chooses the experts who speak at its monthly meetings. “I’ve learned that Michigan supplied almost all of the iron ore for World War II, how copper came to be in the Upper Peninsula, and about groundwater contamination. We’ve had talks about how glaciers brought rocks into Michigan and Wisconsin. It’s a learning process, it’s fun, and I enjoy it,” he says. hen he was a kid, before he was a student at Kalamazoo Central High School, Karlo Delos Angeles, now a 26-year-old graduate student at Western Michigan University, was given a Nintendo gaming system and an infamous game called Super Mario Bros. "I started from the classics, and I've been playing ever since," he says, taking a break from overseeing tryouts in January for Western Michigan University's competitive gaming club teams. Delos Angeles now is a team manager for three of WMU’s esports club teams as the university jumps ahead of its peers in establishing and funding an esports program. Clockwise from top left: Gamers participate in a tournament at Glitch Gaming in Portage; competitors play at the WMU Esports Arena; gaming stations at the arena await players; video games of all types are played at LFG Gaming Bar in Kalamazoo. "Thursday Fight Night" has fighting game tournaments involving such games as Street Fighter V, Tekken 7, Dragon Ball FighterZ and Soul Caliber VI. "There are pretty close groups that come in and play video games, almost like a club," says LFG owner Amy Spalsbury. LFG was preceded on the gaming scene by Glitch Gaming, which opened at 300 E. Centre Ave. in Portage two years ago. Glitch has focused on a larger segment of the gaming market by hosting more frequent tournaments, which almost solely involve single or team-fighting games. Glitch has carved out a niche within the gaming community by offering a "communal approach," says Danni Washington, 27, Glitch manager. Its main gaming gallery holds dozens of consoles and computers positioned in circles, and appears to be equally as inviting for hanging out with friends as it is for introducing newbies to gaming. "Quite a few people will come in large groups but will play on their own game," says Washington. "Our sweet spot is social gaming and kids’ parties," though area high schools have held esports team tryouts and practices at Glitch. And, once a month, Glitch still hosts a tournament for the game Super Smash Bros. In January, 62 people competed for a small cash price and bragging rights. ne of the fastest-growing sports in the world in popularity and revenue — competitive gaming, or esports — is, not coincidentally, one of the most accessible. That accessibility is a big driver of the growth in esports’ global audience, with audience numbers quickly rivaling those of traditional mainstream sports. And that audience growth is resulting in skyrocketing revenues for the industry. Top: Computers await players at WMU’s Esports Arena. Right: Esports events, like the Dota 2 International, attract tens of thousands of spectators. popularity, however, raise the bar for players who want to compete at a professional level. Detroiter Norris Howard remembers his first foray into video games was playing Duck Hunt on an original Nintendo console, and he says his interest in gaming kept him from getting in trouble as a kid. Now gaming is his job: He's a host and producer of CheckpointXP, a daily, live, Detroit-based syndicated radio program broadcast to more than 60 affiliates in North America that has a live show on the streaming site Twitch. "If you're used to listening to ESPN Radio, our format is very similar," Howard says, "but we focus on esports and video games." Of the hundreds of video games out there, the most popular and lucrative are fighting games, which have been around for decades in some format and style. But those two-player games of a few decades ago — think the popular Street Fighter, where two players battle using the fighting skills their character is trained in — are a diminishing part of the market. The more popular games now, Howard says and global gaming data show, are multiplayer online battle arena (MOBA) games and first-person shooter (FPS) games. In MOBA games, like League of Legends and Dota 2, teams compete against other teams and the traps and rewards programmed into the game. In FPS games, like team and group games Overwatch and Call of Duty, the screen shows what the individual character sees, rather than a team view. from the traditional sporting world are crossing over into the digital realm. Take sponsorships, for example. For smaller, less internationally known teams, "their lifeblood is sponsorships," Howard says. Those can come from brands that make mouse pads or headsets or involve larger sponsorships of an event, competition or broadcast. For example, the Overwatch League (OWL) — owned and operated by the video game’s maker, Blizzard Entertainment — has sponsorship deals with Coca-Cola and State Farm Insurance, Howard says. In addition, game-owned leagues are launching a franchise model, where teams are created to win the lucrative prize money and the leagues reinvest those earnings into the games and operations. "In 2018, the American franchising model for traditional sports found its way into both the Overwatch League and North American League of Legends Championship Series (NALCS), selling franchise slots to participants for large sums of money," reported the industry publication The Esports Observer. "The first year of franchising in the NALCS resulted in teams paying $10-$13M USD franchising fees, and spots for OWL’s inaugural season reportedly went for $20M." Another revenue stream for game makers, which doesn’t have a traditional sports example to follow, is in-game purchases, called micro-transactions, such as cosmetic upgrades to a character, like a new “skin” for their weapon that makes it look more menacing. Your legacy and your wealth are about more than money. They empower and protect the people and causes you love. pastime is quickly broadening its scope. Esports are being considered for inclusion in the 2024 Olympics (though there are concerns that formal university-level governance of esports would mean college competitors can't get paid). Above: One of the few women on WMU’s esports teams competes against other players at the university’s Esports Arena. Right: Gamers watch players compete in a Super Smash Bros. tournament at Glitch Gaming. Putting on a large esports event includes the commercial aspect, such as securing corporate sponsorships, as well as technical engineering to ensure all players and spectators can see and hear what they are supposed to. Good lighting, for example, creates the right colorful ambience, and live commentary must be honed to professional standards. There’s nothing quite like the feeling you get when you come home to a garage that’s clean and organized. Make this high-traffic space more inviting and easier to maintain order with our clever organization solutions. In early January, as club team tryouts were taking place and about a month later, on Feb. 17, teams from the University of North Texas and the University of Illinois at UrbanaChampaign played two tournaments against Delos Angeles' teams. "Michigan is an underdog in competitive gaming … but we will start to see more effort being put in," Napier says. "Kalamazoo will help pave that way when they see how seriously we are taking this." "There are not many college arenas. Most schools just have a computer lab," Napier says. "We're separating ourselves from pretty much any other college doing esports right now." He says teams from the University of Michigan and Michigan State University have come to play in tournaments at WMU’s arena, and Napier has begun outreach to businesses about hosting team-building events at the facility. He also gives tours of the arena to schools looking to create an esports program or arena. Napier also sees opportunities to hold summer camps for area high school students at WMU’s arena. working with a team, communicating deliberately and effectively, and setting and achieving goals. Napier, Delos Angeles and other Bronco esports club officials who were in the technical booth overseeing the winter session tryouts, all say esports is a better conduit for those lessons than traditional sports, if only because more people can play esports. "If someone plays football, you see them as a physical specimen," Napier says, noting that esports requires brain muscle and the ability to teach eyes, ears and hands to be equally as responsive. "This is like chess on steroids." Inclusivity is part of WMU President Edward Montgomery’s mandate for the university, and Napier says it’s also integral to his mission as he coordinates the components that make up esports on campus. During club tryouts, there was indeed a rainbow of participants representing diverse racial and ethnic groups among the more than two dozen who were trying out. However, only two women were playing. Napier says he is working with the few female gamers who came to the tryouts to understand and implement better ways to attract more of them. "The main thing is skill and the ability to work with your team," he says of esports in general. "It doesn't matter your gender, background or age." Expertly trained for this exact moment. When struggling with anxiety or depression, there are moments of darkness, of brokenness…when things start to come unraveled. At Pine Rest, our clinicians are expertly trained for these exact moments in your life. Here, you can begin to piece your life back together. Don’t let your moments define you, define your moments. that story relevant to contemporary life and their own personal stories. “My intention is to create images so compelling that they become the record for our place on the timeline of Potawatomi and American history,” Hoogstraten says. Understanding regalia Many people don’t understand the true definition of regalia, says Hoogstraten. Regalia is traditional tribal dress; these are not costumes. “Costumes are something that you put on when you’re pretending to be something you’re not,” she explains. Regalia is the exact opposite: It tells who a person is. No two examples of regalia are alike. An individual might select a certain color for their regalia because of their birth order — such as blue to represent being the oldest — or choose a jingle dress, which is the medicine dress, because somebody in their family has become ill or passed away. “This is each person’s story, and it’s an evolving story,” Hoogstraten emphasizes, noting that a person can change their regalia throughout their lifetime. Photographer Sharon Hoogstraten (far left), a Kalamazoo native, captures modern Potawatomi in their regalia in these portraits: Amelia Tyree, left; Coby Lehman, above; and Addy Raider, right. ARTS ENCORE An example of this occurred during her very first photo shoot. A man arrived in a white ribbon shirt and ribbon pants. “Nothing blingy,” she says. But the color white represents bereavement, and he began wearing this regalia after recently losing his wife. Hoogstraten found the man’s story compelling and asked him to write it down — which ultimately led her to ask each person she photographed thereafter to write something about their ancestry, their regalia or why preserving traditions matters to them. These written stories are displayed alongside their portraits in the exhibit. “That’s become almost as important as the photographs,” she says. The idea of photographing Potawatomi in their regalia had percolated in the back of Hoogstraten’s mind for some time. The project came to life in 2010, when she attended the Citizen Potawatomi Family Reunion Festival in Oklahoma. The organizers found out that Hoogstraten was a photographer. She told them her idea, and they found her a space to take photographs. “I don’t think I had more than 15 portraits at the end of it, but it (taking photographs of people in their regalia) continued for the next three or four years,” she says. Since that time, Hoogstraten has taken close to 200 photographs of people from every state that has a Potawatomi nation — Michigan, Wisconsin, Kansas and Oklahoma — and from Canada. In 2014, Dancing for My Tribe traveled the country, with the first exhibit held at Rockefeller Memorial Chapel at the University of Chicago. The exhibit has also appeared at the Arts Council of Greater Kalamazoo, at the Epic Center; the State of Illinois Building, now known as the James R. Thompson Center, in Chicago; and the Wilmette History Museum, in Wilmette, Illinois. Because she is a “hometown girl,” Hoogstraten found it exciting to have her exhibit in Kalamazoo. The Wilmette History Museum also held a special meaning for her, since it stands on the land of her direct ancestors, the Ouilmettes. Opposite page: A touch of the modern à la Star Wars infiltrates this young Potawatomi’s regalia. Left: Georgia “Dolly” Potts wears a traditional beaded amulet with her regalia. Above: Feathers are an important theme in Todd Miller’s regalia as they represent fallen warriors. Above: Leonard Church’s regalia features patches from the U.S. Marine Corps. Right: Alilee Church’s regalia features a bright ribbon fringe. Gaslight — A suspenseful thriller about a man who tries to drive his wife insane, 8 p.m. April 5, 6, 12, 13, 19 & 20, New Vic Theatre, 134 E. Vine St., 381-3328. Tony & Tina's Wedding — WMU Theatre invites you to this big, fat Italian wedding, 7 p.m. April 4, 5 & 6; 5 p.m. April 7, Cityscape Events, 125 S. Kalamazoo Mall, 387-6222. Boney James: The Honestly Tour — Grammynominated R&B/jazz saxophonist, 7:30 p.m. April 24, State Theatre, 345-6500. The Dip — Seattle-based soul, funk, pop and rock band, 8 p.m. April 24, Bell's Eccentric Café, 382-2332. The Accidentals — Indie, folk and rock trio from Traverse City area, 8:30 p.m. April 25, Bell's Eccentric Café, 382-2332. The Go Rounds — Kalamazoo-based rock and folk quartet, 9 p.m. April 26, Bell's Eccentric Café, 382-2332. Of Masquerade and Rhymes — 7:30 p.m. April 4, 5, 6, 12 & 13; 2:30 p.m. April 7, Queer Theatre Kalamazoo, 315 W. Michigan Ave., qtkalamazoo.com. Mason Jennings — Folk, acoustic and indie singer/ songwriter, 8:30 p.m. April 27, Bell's Eccentric Café, 382-2332. Psycho Beach Party — A comedy blending ’50s psychological thrillers, ’60s beach movies and ’70s slasher films, 7:30 p.m. April 5, 6, 12 & 13; 2 p.m. April 7 & 14, Parish Theatre, 405 W. Lovell St., 343-1313. OK Go: The Live Video Tour — Treadmill-dancing indie rock band and MTV stars, 7 p.m. April 28, State Theatre, 345-6500. The Rider's Ghost — All Ears Theatre radio theater production, 6 p.m. April 6, First Baptist Church, 315 W. Michigan Ave., 342-5059. WMU Drum Choir — 5 p.m. April 1, Dalton Center Recital Hall, WMU, 387-4667. Gold Company II — WMU vocal jazz ensemble, 7:30 p.m. April 2, Dalton Center Recital Hall, WMU, 3874667. WMU Voice Faculty Showcase — Bullock Performance Institute concert, 7:30 p.m. April 3, with pre-concert talk at 7 p.m., Dalton Center Recital Hall, WMU, 387-2300. Spring Conference on Wind and Percussion Music — Guest composer and conductor Carter Pann, 7:30 p.m. April 4, Miller Auditorium, WMU, 387-4667. Rain: A Tribute to the Beatles — This tribute band presents hits from the Beatles’ Abbey Road album, plus early Beatles favorites, 8 p.m. April 5, Miller Auditorium, WMU, 387-2300. University Symphonic Band and University Concert Band — 3 p.m. April 7, Miller Auditorium, WMU, 387-4667. Advanced Jazz Ensemble and Gold Company — 7:30 p.m. April 7, Dalton Center Recital Hall, WMU, 387-4667. University Jazz Lab Band — 7:30 p.m. April 9, Dalton Center Recital Hall, WMU, 387-4667. Flutist Martha Councell-Vargas — Bullock Performance Institute concert, 7:30 p.m. April 10, with pre-concert talk at 7 p.m., Dalton Center Recital Hall, WMU, 387-2300. Women Rock — Kalamazoo Symphony Orchestra celebrates female pop and rock 'n' roll singers, 8 p.m. April 12, Miller Auditorium, WMU, 387-2300. Crybaby Concert — Kalamazoo Brass Collective performs in this mini-concert for children under the age of 5 and their families, 11 a.m. April 13, Kalamazoo Public Library – Oshtemo Branch, 7265 W. Main St., 382-7774. One Small Step: A Multimedia Performance — Kalamazoo Concert Band celebrates the 50th anniversary of the first moon landing, 7:30 p.m. April 13, Chenery Auditorium, 714 S. Westnedge Ave., kalamazooconcertband.org. Choral Showcase: Collegiate Singers, Cantus Femina and University Chorale — 8 p.m. April 13, Dalton Center Recital Hall, WMU, 387-4667. Blendings — Vocal ensemble performs in Second Sundays Live concert, 2 p.m. April 14, Parchment Community Library, 401 S. Riverview Drive, 343-7747. Concerto Concert: University Symphony Orchestra — 3 p.m. April 14, Miller Auditorium, WMU, 387-4667. Orchestra Rouh & KSO Petting Zoo — Children of refugee families play in spirit and hope (rouh), 3 p.m. April 14, Westminster Presbyterian Church, 1515 Helen Ave., Portage; westminsterartfestival.org. Gilmore Rising Star Zhang Zuo — The Chinese pianist performs works by Bach, Schumann and Ravel, 4 p.m. April 14, Wellspring Theater, 359 S. Kalamazoo Mall, 359-7311. Music Therapy Clinic Concert — 7 p.m. April 15, Dalton Center Recital Hall, WMU, 387-4667. Fontana Presents: Camerata RCO — Members of the Royal Concertgebouw Orchestra perform works of Mozart, Brahms and Dohnányi, 7:30 p.m. April 18, Dalton Center Recital Hall, WMU, 382-7774. Burdick-Thorne String Quartet — The quartet plays works of Beethoven, noon April 22, Atrium Lobby, Borgess Medical Center, 1521 Gull Road, 349-7759; noon April 24, Garden Atrium, Bronson Methodist Hospital, 601 John St., 349-7759. 2019 Bach Festival Week — Concerts highlighting the works of J.S. Bach and other composers, April 24– May 6, 337-7407; see kalamazoobachfestival.org for schedule. Guest Artists in Concert — Featured soloists for Bach Festival’s production of Carmina Burana share music from opera, Broadway and more, 7:30 p.m. April 26, Stetson Chapel, Kalamazoo College, kalamazoobachfestival.org. (Also see Carmina Burana, April 28.) Baby Grands — Gilmore Rising Star Kate Liu presents a piano recital for families, 10:30 a.m. April 27, Kalamazoo Public Library, 315 S. Rose St., 342-1166. Kalamazoo Community Chorale Spring Concert — 3 p.m. April 28, First United Methodist Church, 212 S. Park St., kalamazoocommunitychorale.com. Carmina Burana — Kalamazoo Junior Symphony Orchestra, Bach Festival Chorus and Kalamazoo Children's Chorus present Carl Orff’s cantata, 4 p.m. April 28, with pre-concert talk at 3 p.m., Chenery Auditorium, 337-7407, kalamazoobachfestival.org. Gilmore Rising Star Kate Liu — The American pianist performs works by Mozart, Schubert and Prokofiev, 4 p.m. April 28, Wellspring Theater, 359-7311. COMEDY Fun Dumpster — Graduates of Crawlspace Theatre Productions improv classes present improv comedy, 8 p.m. April 5, Crawlspace Comedy Theatre, 315 W. Michigan Ave., 599-7390. Family Secret — Local improv group presents short- and long-form improv comedy, 8 p.m. April 6, Crawlspace Comedy Theatre, 599-7390. Crawlspace Eviction: Stew — Improv and sketch comedy show inspired by stew, 8 p.m. April 19 & 20, Crawlspace Comedy Theatre, 599-7390. Solo Artist: Ranja Friedman — Acrylics on canvas, through April, Portage District Library, 300 Library Lane, 329-4544. Young Artists of Kalamazoo County — Creative, colorful, whimsical art by students in grades K–8, through April 14. The Expressionist Figure — Mid-20th-century Expressionist paintings, through May 5. The Feeling is Mutual: New Work by Maya Freelon — Tissue paper sculptures, through May 31. Rewards of Wisdom: Contemporary Chinese Ink Painting — Distinguished artists and rising stars express virtue, peace, wisdom, beauty, meditation, science, knowledge, and philosophy through their brushwork, through June 16. 2019 High School Area Show and Congressional Art Competition — Artwork by high school students in the region, April 26–May 26, with opening reception 5:30–7:30 p.m. April 25. Events ARTbreak — Weekly program about art, artists and exhibitions: More Human than Human, how humans have portrayed the human figure throughout art history, video, April 2; Art School Residents, Part 3, talk by artists Taylor Scamehorn, Sarah Nott and Francisco Ormaza, April 9; Sky Ladder: The Art of Cai GuoQuiang, Part 1, video, April 16; Art School Residents, Part 4, talk by artists Audrey Mills, Jules Abbe and Courtney Nelson, April 23; Sky Ladder: The Art of Cai Guo-Quiang, Part 2, video, April 30; sessions begin at noon, KIA Auditorium. Book Discussion: The Lost Sketchbook of Edgar Degas — Marsha Meyer leads a discussion of this book by Harriet Scott Chessman, 2 p.m. April 10. Art League Lecture: The Face of Greatness: Abraham Lincoln in Art and Photographs — Art historian Mark Pohlad speaks about the history of photography and American art, 6:30 p.m. April 10. Sunday Tour — Docent-led tour of the Young Artists of Kalamazoo County exhibit, 2 p.m. April 14. 17 Days (Volume 11) — One artist’s video work per day is played on 50-inch plasma screens, through May 1, Atrium Gallery. Annual Student Exhibition – WMU art students display their works, April 5–21, Monroe-Brown Gallery, with reception 5–7 p.m. April 4. No Dark in Sight: Light and the Night It Transforms – Exhibition of Bill Davis’ work examining light pollution in locations such as Kalamazoo, Las Vegas and Machu Picchu, April 4–21, Netzorg and Kerr Gallery, with reception 5–7 p.m. April 4. Joel Whitaker – Visiting artist lecture, 5:30 p.m. April 11, Room 2008. Posters on the Wall — Colorful and typographically driven posters by printmaker Amos P. Kennedy Jr., through April 26, Kalamazoo Book Arts Center, 326 W. Kalamazoo Ave., Suite 103A, 373-4938. WISH YOU COULD GO TO THESE INCREDIBLE LOCAL CULTURAL ATTRACTIONS FOR FREE? Art Hop — Art at locations in Kalamazoo, 5–8 p.m. April 5, 342-5059. 2019 Westminster Art Festival: Migration: Traveling Mercies — Juried exhibition of visual art and poetry on the theme of migration, April 6– May 1, with awards presentation at 5 p.m. April 26, Westminster Presbyterian Church, 1515 Helen Ave., Portage; see schedule at westminsterartfestival.org. Say Something! Media & Ideas Festival — Public Media Network combines the former Teen Filmmaker Festival and North by Midwest (NxMW) Micro-Budget Film Festival into this new event in which creators of media and spoken word address social and environmental issues, 1–8 p.m. April 13, Jolliffe Theatre, Epic Center, 359 S. Kalamazoo Mall, 343-2211. LIBRARY & LITERARY EVENTS Kalamazoo Public Library Page Turners Book Club — Discussion of Queen Sugar, by Natalie Baszile, 6:30 p.m. April 1, Oshtemo Branch, 7265 W. Main St., 553-7980. Michigan POW Camps in World War II — Author Gregory Sumner tells about 6,000 detainees in Michigan and the friendships established with their captors, 2 p.m. April 6, Oshtemo Branch, 553-7980. The Hate U Give: The Book vs. the Movie — Local filmmaker Tirrea Billings discusses pivotal differences in the movie retelling of the novel, 6 p.m. April 9, Oshtemo Branch, 553-7980. Michigan, My Michigan: Urban Life, Immigration and Progressivism — Historian Lynn Houghton discusses the end of the 19th century to the start of the growth of the automotive industry, 7–8:30 p.m. April 15, Van Deusen Room, Central Library, 315 S. Rose St., 342-9837. Reading Together: Meet the Author: Angie Thomas — Hear the author trace the development of her book and discuss race, activism and social change in America, 7–9 p.m. April 17, Chenery Auditorium, 714 S. Westnedge Ave., 342-9837. Classics Revisited — Discussion of Prejudices: First Series, by H. L. Mencken, 7 p.m. April 18, Boardroom, Central Library, 342-9837. The Kalamazoo Corset Workers Strike — Tom Dietz explores the story of Kalamazoo’s largest employer in the early 20th century, 7–8:30 p.m. April 18, Van Deusen Room, Central Library, 342-9837. Purchase your membership today at any one institution to get access to ALL SIX in May. Urban Fiction Book Discussion — Discussion of I Don't Want You Back, by Chenell Parker, 6 p.m. April 23, Alma Powell Branch, 1000 W. Paterson, 553-7960. Good People, Bad Luck — Fiction writers Andy Mozina, Bonnie Jo Campbell and Deborah Carol Gang and poet Oliver Baez Bendorf read from their works that consider the collision of bad luck and human nature, 7 p.m. April 25, Van Deusen Room, Central Library, 342-9837. EVENTS ENCORE Parchment Community Library 401 S. Riverview Drive, 343-7747 Parchment Book Group — Discussion of Unsheltered, by Barbara Kingsolver, 6:30 p.m. April 1. Envisioning Our River Town Hall — Sandy Bliesener leads a discussion about Parchment’s riverfront and its development, 7–8:30 p.m. April 11. Front Page: Donuts & Discussion — Discussion of preserving our environment through recycling, 10:30 a.m.–noon April 20. Mystery Book Club: Meet the Author — Discussion of The Man in the Crooked Hat, with author Harry Dolan, 6:30 p.m. April 22. Yum's the Word: A Virtual Tour of Grand Traverse Distillery — Learn the art of making and deciphering the varieties of single malt and whiskey blends by sampling, 6:30 p.m. April 24; registration required. International Mystery Book Discussion: Israel and Italy — Discussion of The Thieves of Heaven, by Richard Doetsch, 7 p.m. April 11. Classic Movie: Libeled Lady — View the 1936 movie about a wealthy socialite’s libel lawsuit against a major newspaper publisher, 2–4 p.m. April 13. Reading Together: Book Talk — Discussion of The Hate U Give, by Angie Thomas, 7 p.m. April 2. Open for Discussion — Discussion of Just Mercy, by Bryan Stevenson, 10:30 a.m. April 16. Friends of the Library Book Sale — 9 a.m.–3 p.m. April 6. Bad Poetry Night — Read a bad poem or read a beautiful poem badly, 7–9 p.m. April 26. SciFi/Fantasy Discussion — Discussion of the charm of reboots and what makes them successful, 7 p.m. April 9. Duesenberg: Celebrating an American Classic — This exhibition showcases up to 20 rare Duesenbergs in rotation, through fall. Lecture Series — Fisher Body Craftsman Guild: Modeling the Future, Paul Tatseos, Rich Ray, Dwight Conger and John Jacobus, April 7; Riding Across the Sands of Time: Dune Rides, Dune Scooters, Dune Schooners, Dunesmobiles and Dune Buggies, M. Christine Byron and Thomas R. Wilson, April 14; Route 66: Adventures, Stories and Photographs from Chicago to Santa Monica, John Lacko, April 28; all lectures begin at 3 p.m.
Music, song and dance of over a dozen countries will take you on a journey to another place and another time. Your Kalamazoo Wings! The First 45 Years — The history and culture of Kalamazoo’s oldest professional sports franchise, through April 7. What We Carried: Fragments and Memories from Iraq and Syria — Refugees’ journeys to America through images of their personal carried objects, through April 15. Math Moves: Experiencing Ratio and Proportion — A multi-sensory interactive exhibit to set up, measure, describe and compare ratios and proportions in a fun approach to problem solving, through June 2. Unraveling Earth and Space Science Mysteries — MSU Science Festival presents hands-on activities to unravel science mysteries, 10 a.m.–4 p.m. April 13. Sunday Series — Most Unusual Products of the Upjohn Company, Jeremy Winkworth, Upjohn historian, April 14; From Undercover to OutFront: The Story of Kalamazoo’s LGBTQ Community, OutFront Executive Director Denise Miller discusses the organization’s beginnings and future, April 28; sessions begin at 1:30 p.m., Stryker Theater. NATURE Kellogg Bird Sanctuary 12685 East C Ave., Augusta, 671-2510 Sustaining the Vision Open House — Free admission in celebration of the late W.K. Kellogg’s birthday, 11 a.m.–4 p.m. April 7. (Also see free Kellogg Manor House tours the same day, under Miscellaneous.) Birds and Coffee Walk — A morning bird walk and discussion over coffee, 9–10:30 a.m. April 10. Earth Day — Free admission to the bird sanctuary, 9 a.m.–5 p.m. April 22. Binder Park Zoo Opening Day — 10 a.m.–4 p.m. April 17, 7400 Division Drive, Battle Creek, 269-979-1351. Audubon Society of Kalamazoo — Barb Jensen speaks on “Osprey Recovery Efforts in Michigan,” 7:30 p.m. April 22, People’s Church, 1758 N. 10th St., 375-7210. MISCELLANEOUS Kalamazoo Foodways Symposium — Middle Eastern culture, cooking and food, April 5–6, Bronson Healthy Living Campus, 615 E. Crosstown Pkwy. ; keynote speaker Liana Aghajanian, 6 p.m. April 5, Kalamazoo Valley Museum, 230 N. Rose St.; kvcc.edu/ kalamazoofoodways. Earth Day Celebration and 5K & Kids Raccoon Run — An Earth Day run and free admission, 9 a.m.–5 p.m. April 20, with runs at 9 a.m. and 10 a.m., Kalamazoo Nature Center, 7000 N. Westnedge Ave., 381-1574. Kalamazoo Earth Day Festival — Exhibits, family activities, music, art, vendors, food and drinks, noon–5 p.m. April 20, Bronson Park, naturecenter.org/ Bronson-Park-Earth-Day. Statewide Astronomy Night — Astronomy-related activities for all ages, 4–8:30 p.m. April 12, Kalamazoo Valley Museum, 230 N. Rose St., 373-7990. Green-a-Thon — Pre-Earth Day festival with exhibits, music, games and giveaways, 11 a.m.–3 p.m. April 13, Celery Flats, 7335 Garden Lane, Portage, 329-4522. Building a Monarch Waystation — Chad Hughson shares ideal plants and yard conditions for a waystation, 10:30 a.m. April 13, Westminster Presbyterian Church, 1515 Helen Ave., Portage; westminsterartfestival.org. Kalamazoo Numismatic Club Annual Spring Coin Show — Buy, sell and trade coins, paper money and memorabilia, 9 a.m.–3 p.m. April 6, Kalamazoo County Expo Center North, 2900 Lake St., 491-0962. Spring Cleaning Model Railroad Swap Meet — Buy and sell model railroad items, 10 a.m.–3 p.m. April 6, Kalamazoo County Expo Center South, 344-0906. Annual Egg Hunt — Egg hunt and Easter activities, 2–4 p.m. April 20, Mayors’ Riverfront Park, 251 Mills St., 337-8191. Sustaining the Vision Manor House Tours — Free admission in celebration of the late W.K. Kellogg’s birthday, 11 a.m.–4 p.m. April 7, W.K. Kellogg Manor House, 3700 E. Gull Lake Drive, Hickory Corners, 671-2160. Kalamazoo Dance — Monthly ballroom dancing at 8 p.m., with Texas 2 Step lesson at 7 p.m., April 20, The Point Community Center, 2595 N. 10th St., kalamazoodance.org. Ladies’ Night Out — Celebrate women with a special presentation, vendors and food, 5–7 p.m. April 10, Ladies’ Library Association, 333 S. Park St., 344-3710; reservations required. Antique Bottle & Glass Show — Flasks, medicines, fruit jars, dairy bottles and related glass, 10 a.m.–3 p.m. April 13, Kalamazoo County Expo Center, Room A, 616-581-7005. Kalamazoo Entrepreneur Expo — Over 25 local entrepreneur vendors, boutiques, food, marketing and health care, 6–10 p.m. April 26, The Foundry, 600 E. Main St.; registration required at mylesahead06@ gmail.com. Southwest Michigan Postcard Club Show & Sale — Postcards from the 1890s to present, 10 a.m.–5 p.m. April 13, Kalamazoo County Expo Center, North, 517-230-0734. Olde Tyme Plow Days & Swap Meet — Plowing, antique tractors, flea market, crafts, kiddie train and blacksmithing, April 27 & 28, Scotts Mill County Park, 8451 S. 35th St., Scotts, 223-0003. Country Dancing in Kalamazoo — Contra and square dancing to live music, 7:30–10:30 p.m. April 13 & 27, with beginner’s workshop at 7 p.m., Oshtemo Grange Hall, 3234 N. Third St., countrydancinginkalamazoo. com. Spring Art & Craft Sale — Handcrafted, homemade art and craftworks, 9 a.m.–4 p.m. April 27, 10 a.m.–4 p.m. April 28, Kalamazoo County Expo Center, 349-1185. I Love the ‘90s Bash — Wear ‘90s clothing to participate in a bar crawl featuring drink specials and ‘90s music, 3–10 p.m. April 14, various venues, facebook.com/events/2208047249515008/. Kalamazoo Reptile & Exotic Pet Expo — Buy, sell or trade reptiles, amphibians and small mammals, 10 a.m.–3 p.m. April 20, Kalamazoo County Expo Center North, 779-9851. Pinball at the Zoo — Games for sale and play, auction and tournaments, 2–10 p.m. April 25, 1–10 p.m. April 26, 9 a.m.–6 p.m. April 27, Kalamazoo County Expo Center South, 231-519-4514. KazooPex Stamp & Cover Show — Buy and sell stamps, covers, postcards and supplies, 10 a.m.–5 p.m. April 27, 10 a.m.–3 p.m. April 28, Kalamazoo County Expo Center North, 375-6188. Kalamazoo Record & CD Show — Collector records, music memorabilia and supplies, 11 a.m.–4 p.m. April 28, Kalamazoo County Expo Center, Room A, 734-604-2540. Murray Perahia has been mesmerizing audiences with his legendary performances for almost 45 years. His interpretations of great repertoire offer timeless lessons in sensibility, sophistication, and expressive intensity. Don’t miss your opportunity to see and hear this world-renowned pianist. Bird Nobody can spank the sax like Charlie. pockets full of trills and scats and bebop. so fast on the brass youâ&#x20AC;&#x2122;d think he could outstrip the wind. taking all us yardbirds along for the ride. who ferry strangers double-time across the Triborough Bridge. Doud is an award-winning journalist and poet. She has written an extensive collection of persona poems, including "Bird," a remembrance of jazz saxophonist Charlie Parker that she read at last yearâ&#x20AC;&#x2122;s Kalamazoo Poetry Festival (this yearâ&#x20AC;&#x2122;s fest is April 11-13). She won an award from America Magazine for her poem "The Boat House," a sketch of poet Dylan Thomas. with our fast, friendly expertise and highspeed equipment. The job will always be ready on time and you won’t get soaked. source of significance as well as friends and camaraderie. What made you go from playing casually to esports? It was a long journey. The first big change happened when I got into a fighting game called Ultimate Marvel vs. Capcom 3. I'd been playing competitively in Halo (a first-person, science-fiction shooter game) and games like that, but, like, nothing ever really came of it. I didn't have what it took to get to the professional level or anything, and I didn't know why. It wasn't until I got a friend into Ultimate Marvel vs. Capcom 3 and taught him how to play it and he started getting better than me. There's this thing called a “limited mindset” or a “fixed mindset” where you have limited thinking about your ability to get better, like you think you have a skill cap and you’ve already hit it. And that's where my mind was. In that game I could look at the hours that my friend had logged and see that in training mode he had 10 times more hours than I did. That's when it clicked for me. My mindset around the idea of practice and skill shifted. I needed to actually, like, practice. I needed to have more confidence and hone what I wanted to get better at. That took me on a weird journey of personal development, competitive gaming and entrepreneurship. Hey. We just landed. Be home in 10 minutes.